Mix ground meat, onion, 1 tsp salt, black pepper, bread crumbs and parsley in a bowl (feel free to use your hands for better mixing). Grab egg size pieces and make finger shaped meatballs. If have time, leave the meatballs in the fridge for about 1-2 hours. Meanwhile, peel the potatoes and cut them like apple slices. Fry them lightly in ½ cup of canola oil and place over a round oven tray. Sprinkle 1 tsp salt over. Leave the middle of the tray for the meatballs. In a saucepan, place canola oil, tomatoes and tomato paste. Saute for a couple of minutes then, add hot water. Cook for about 5-6 minutes. Stir in the remaining salt and sugar. Preheat the oven to 400 F (200 C). 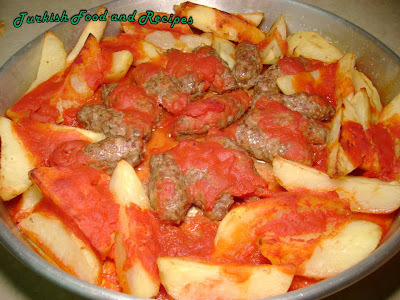 Place the meatballs in the middle of the tray and pour the tomato sauce all over the tray. Bake till potatoes and meatballs are cooked (for about 30-45 minutes). Kiyma, sogan, 1 tatli kasigi tuz, karabiber, ekmek ici ve maydanozu bir kapta guzelce karistirarak yogurun. Yumurta buyuklugunde alin ve parmak seklinde kofteler yapin. Zamaniniz varsa kofteleri buzdolabinda 1-2 saat dinlendirin. Diger yandan patatesleri soyun ve elma dilimi seklinde dilimleyin. Yarim su bardagi kanola yaginda hafifce kizartin. 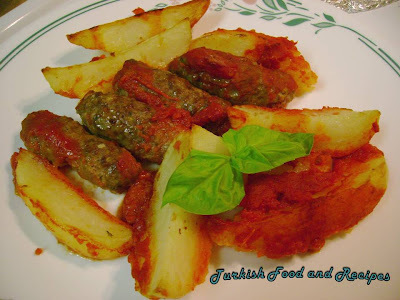 Yuvarlak bir firin tepsisinin kenarlarina uzunlamasina patates dilimlerini dizin ve uzerlerine 1 tatli kasigi tuzun yarisini serpistirin. Diger yandan 1-2 yemek kasigi kanola yagina domates, domates salcasi ve sicak suyu ilave edin. Yaklasik 5-6 dakika kadar pisirin. Geri kalan tuzu ve sekeri ilave edin. Kofteleri tepsinin ortasinda kalan bosluga yerlestirin. Domates sosunu tepsinin uzerinde gezdirin. Onceden isitilmis 200 C (400 F) firinda kofteler ve patatesler pisene dek pisirin (yaklasik 30-45 dakika). So wonderful! We liked this dish a lot. This is a definite addition to our meatballs collection! We had the cucumber-yogurt salad as a side to this. It was a great accompaniment.